13 Modern Bridal Bits & Baubles! / Hey, EEP! 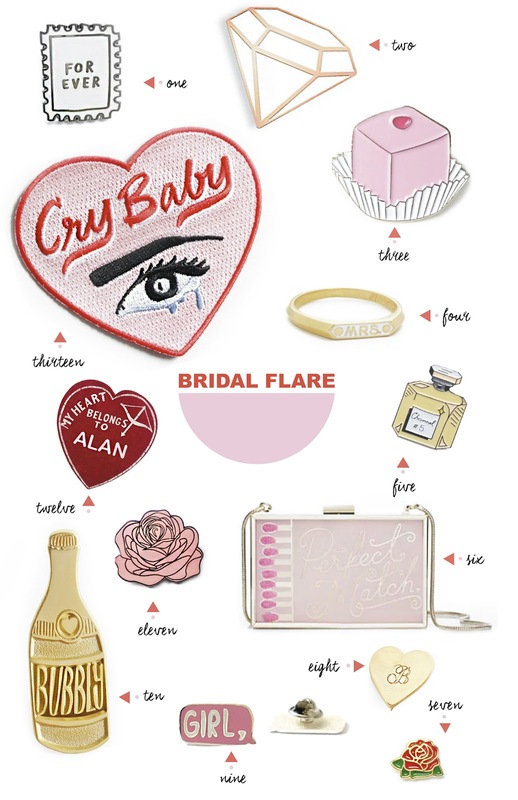 13 Modern Bridal Bits & Baubles! 1. Forever stamp: Love is forever and us brides have stamps on the brain. 2. Diamond: Because you know we still can't stop staring at the one on our finger. 3. Petit Fours: They're pink and cute and remind us of all the tasty wedding cake samples. 4. Mrs Ring: This simple signet is totally welcome to join our fancy finger party. 5. Perfume: A new way to test out our wedding scent before the big day. 6. Match Clutch: Perfect for all pre-wedding festivities and long after the big day. 7. Red rose: It says, "Please still surprise me with roses after you've locked this down." 8. Monogram: We're always looking for new ways to sport our soon-to-be monogram. 9. Girl: To wear in honor of our lovely girl gang who's agreed to stand with us and endure group emails. 10. Bubbly: Because all the champagne...all the time...before, during and after the wedding! 11. Pink Rose: To remind us of the gorgeous bouquets we chose after endless hours on Pinterest. 12. My Heart Belongs To: A mantra to repeat when planning gets tough—it's all that matters, after all! 13. Cry Baby: We already know we're going to sob our eyes out, might as well start owning it now.